The next few decades will witness a rapidly increasing demand for agricultural products. By 2050 current food demand will be doubled by world population and socio-economic growth. The expanding bio-based economy will increase the demand for agricultural products. Urban development will increasingly compete with agriculture for land use. The growing demand for agricultural products needs to be met largely through intensification (produce more from the same land surface) because there is little scope for an increase in agricultural area without doing irreparable damage to vital natural ecosystems. The steady increases in agricultural productivity per unit area seen through the latter part of the 20th century have now plateaued with little opportunity for further increases in efficiency through conventional methods. The dependency of conventional agriculture and food supply on non-renewable resources (e.g. fossil fuels, phosphate) makes it unsustainable in the long run. Ecological intensification has been proposed as a promising solution. Ecological intensification is the optimization of all provisioning, regulating and supporting ecosystem services in the agricultural production process. As such it advocates to maintain or enhance agricultural production through the promotion of biodiversity and associated ecosystem services. In many parts of Europe, agricultural productivity is amongst the highest in the World but depends on unsustainable high levels of external inputs. Here the challenge for ecological intensification would be to reduce reliance on external inputs while maintaining high productivity levels by reestablishment of soil and landscape ecosystem services (Ecological replacement – see Fig. 1). In other parts of Europe, where productivity is less high, the challenge will be to enhance productivity by optimising ecosystem services rather than by increasing agricultural inputs. This is comparable to the situation in the majority of countries outside Europe (Ecological enhancement – Fig. 1). Intensive production systems are highly sensitive to environmental disturbances and disruption of ecosystem services. A further challenge for ecological intensification is the development of novel poly-cropping systems and landscape-scale management of matrix habitats to increase the stability of agricultural production systems and provide ‘Ecological resilience’. Figure 1: Different ways in which ecological intensification can contribute to agricultural production: it is either unexploited (left column), contributes at the expense of the conventional provider (in this case agricultural production: mid column) or contributes additionally, thereby maximizing ecosystem services, rather than trading them off (right column). Ecological intensification is in line with a number of key EU and global policies. It will contribute to the greening of the CAP, will strengthen the Green Infrastructure (COM(2011) 17 final) and is in line with the EU Biodiversity Strategy (COM(2011) 244 final). Furthermore, the approach is at the core of the CBD Strategic Plan for 2011-2020. However, successful adoption of this approach is however critically dependent on the benefits perceived by key stakeholders but, so far, examples of economic benefits of ecosystem services have come mainly from outside Europe. 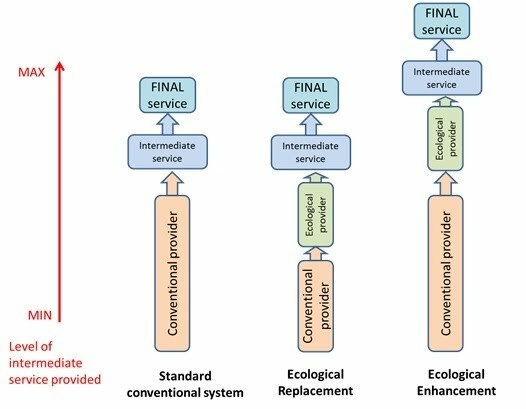 How ecosystem services may be influenced by policy measures at the local, national or EU scale.